Outkast’s comeback lap will also include a homecoming show. 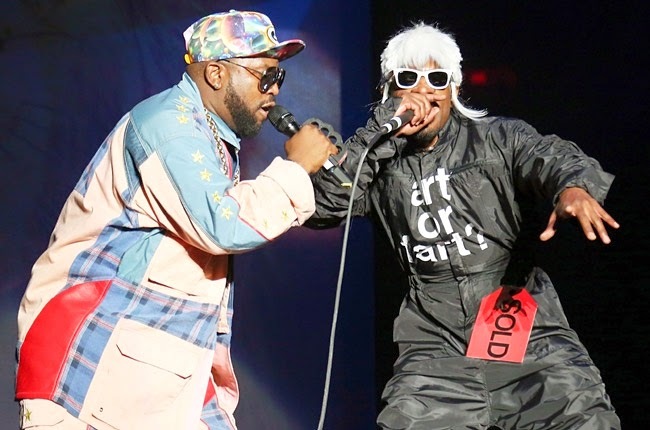 Antwan “Big Boi” Patton and André "3000" Benjamin have announced they'll bring their reunited rap duo to Atlanta’s Centennial Olympic Park on Sept. 27 for a headline concert. Outkast will curate the show, with addition performers to be unveiled in the coming weeks. “It's only right that we give the hometown what we've been giving the rest of the world, Atliens in ATL, homecoming! Festival Killers,” comments Big Boi in a statement. "Coming from Atlanta gave us the freedom to be whatever we ever wanted to be because no one was paying attention. Now that everyone is, we want to say thank you," adds André 3000. A dedicated Website at www.outkastatlast.com will build the buzz ahead of the concert, for which tickets go on sale from June 18 at 10am EST via Ticketmaster. Word leaked last November that Outkast would end its hiatus and return to the road in 2014 in time to celebrate its 20th anniversary. The duo confirmed in January plans for an international headlining festival tour that began at the Coachella Valley Music and Arts Fest and included more than 40 dates throughout the summer. Outkast's tour came close to home when the pair played the CounterPoint Music & Arts Festival in April, a three-day event in Rome, Ga., about 60 miles northwest of downtown Atlanta. Outkast's 2003 double album, "Speakerboxxx/The Love Below," spawned two No. 1 singles ("Hey Ya!" and "The Way You Move") on the Billboard Hot 100 chart and earned the Grammy award for album of the year in 2004. After Outkast released the film "Idlewild" and its accompanying soundtrack in 2006, Big Boi and Andre 3000 parted ways to focus on solo projects. The hip hoppers’ debut “Southernplayalisticadillacmuzik” was released back in 1994.